A five-year prison sentence looms large for a former Nestle plant owner who illegally removed asbestos from his property in violation of the federal Clean Air Act. Our Boston mesothelioma lawyers understand that the 47-year-old defendant has pleaded guilty to allegations by the U.S. Attorney’s Office that he damaged and removed some 2,000 feet of friable asbestos installation without filing the proper notification with the Environmental Protection Agency. During the course of the work, prosecutors say the owner hired unlicensed and inexperienced labor to remove the asbestos. Throughout the removal process, the workers failed to keep the asbestos wet. This is a critical step in asbestos removal that helps to ensure the fibers don’t become airborne, posing a risk that it will be inhaled by those nearby. Inhalation of asbestos can be deadly. Asbestos exposure leads to a number of serious illnesses, including chronic asbestosis and mesothelioma, which is fatal. In addition to improperly removing the material, prosecutors say the workers weren’t given protective respiratory gear. Topping it all off, the asbestos wasn’t taken to a previously-approved landfill site for proper disposal. In this case, it was the workers who tipped off investigators with the U.S. Justice Department that what was happening at the New York work site was not right. The U.S. Clean Air Act, incorporated into Title 42, chapter 85 of U.S. Code, holds that any personnel working on asbestos activities in public, schools or commercial buildings must be accredited. These personnel include workers, inspectors, supervisors, management planners and project designers. The National Emission Standards for Hazardous Air Pollutants for Asbestos, which falls under section 112 of the Clean Air Act, lays the groundwork for safe work practices that will help minimize the release of deadly asbestos fibers during the processing, handling and disposal of materials that contain asbestos. Prosecutors say this is a serious problem, and unfortunately, not an isolated one. The U.S. Attorney’s Office in the Central New York reports they have prosecuted more than 100 such cases in the last 15 years. Boston too has had its fair share of these cases, revealing that the prevalence of this negligence ensures we will be seeing asbestos exposure liability claims for many years to come. For example, in 2011, a contractor and a real estate agent were fined $42,000 for improper asbestos removal from a property in Worcester. 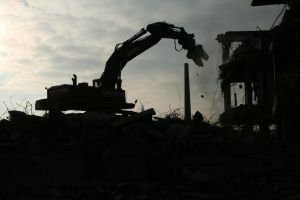 In another case in 2012, Swampscott, a demolition company was ordered to pay $100,000 for improper removal and disposal at a number of locations throughout the state. Prosecutors in the recent New York case say the fine amount – which could reach as high as $250,000 – should take into account the fact that the city has had to hire its own, licensed asbestos abatement firm to conduct proper removal of the hazardous material that remains on site. Workers who are negligently exposed to asbestos and suffer illness as a result are entitled to civil compensation.